Here, we’ll be looking at just some of the ways you can avoid business stagnation in the construction industry. The primary driving factor behind any successful company is its staff. If your staff are skilled, talented and entrepreneurial, your company will go from strength to strength. But if you undervalue the importance of having a superb team, you could risk losing steam in your business. Ultimately, having a team that is talented, professional and friendly producing excellent work is key to success. Top talent attracts large volumes of high-profile clientele because word travels fast when there’s a quality company in town. Although chasing work is a great way to avoid stagnation, producing exceptional finished projects will ensure clients will also seek you out. Top talent in your company is great for encouraging innovative ideas that drive your company forward, but innovation and constant improvement should be your company’s mantra regardless. Always encourage innovation among your employees. How can a job be completed more efficiently? How can standards be improved? Finding unique answers to these questions, and others, provides your company with the ability to adapt and continue to succeed when the spectre of stagnation rears its ugly head. Gathering feedback from your staff and your clients is pivotal to maintaining innovation and improvement. Remember to analyse this data carefully to spot areas where your business is flagging so you can rectify any issues before they spiral out of control. A good managing presence is equally key to success and avoiding stagnation, and a crucial element of good management is the ability to delegate responsibility. Unfortunately, as one manager you can’t be Superman – you can’t do everything yourself. Take the time to learn your team’s strengths and weaknesses, then delegate some of your tasks to them. Think carefully who is capable of completing certain tasks best and assign tasks appropriately. In doing so, you’ll ensure your construction company remains highly efficient and able to avoid periods of stagnation with gusto. By adopting all modern techniques and technologies into your business plan, you can further stave off stagnation. Small businesses can suffer exponential losses if they are unable to compete with larger companies, and equipment and business practice are two of the main reasons why your smaller business may underperform in comparison. As new techniques and technologies arise, remember to learn new methods and purchase all the latest equipment. In this way, you’ll ensure that your business is able to compete with larger companies and to attract fresh construction opportunities to avoid stagnation. 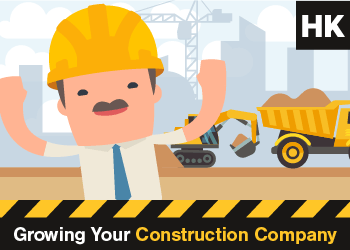 There are thousands of construction companies out there, and a lot of them market themselves in the same way as every other one. This may work fine for years, but it constitutes a ‘just getting by’ mindset that won’t stand up during a period of stagnation. Instead, you should pay close attention to how you appear to your clients. Think carefully about what sets you apart from your competitors, what makes you memorable. If you can’t think of anything, it’s high time you set to improving your services, shaking up your brand and marketing your company more widely. By positively standing apart from the crowd, you’ll enjoy increased business prospects for years to come, helping you avoid stagnation should the market dry up. Finally, a successful construction company also has a supplier behind them that they can rely on 110%. An efficient supply of building materials and tools can mean the difference between stagnation and success. If you’re unable to complete your project on time because you’re always waiting on fresh materials, your reputation could become damaged, and therefore future business prospects are harmed, stagnation more likely. Fortunately, Hitchcock & King have the expertise and efficient services you need to ensure your supply of building materials is never hindered. We have proudly supplied an exceptional selection of timber and builders’ materials, tools and more throughout London for over 40 years. In addition, we have eight operational branches across the capital and offer competitive rates on all our materials. We also offer same/next day delivery for your complete convenience. Contact our friendly and professional team today for more information on our supplies.